Hi Stephen, just saw your AD. I wanted to send a little help, as I have your book and also have it on my kindle, which I pass around. Keep up the good work. I really like your website. You are doing great. I got a copy of your book some time ago, “Out the Bottomless Pit” Very heavy stuff in there. Didn't read the whole book yet, a lot to grasp. Some of it is probably conspiracy theories? Yet again some of it is true stuff, but never heard of before. I would like to get copies of your two new books that are coming out, as soon as they are on the market: THE BOOK of ENOCH-interpretations & the book OF 2ND EZDRAS-interpretations. Dear Julie, In answer to your question about conspiracy theories: Who invented the actual term "conspiracy theories"? It was invented by the CIA Intelligence Agency, in the USA during the 1960's, to throw people off their trail on any given issue. The first line of DEFENSE used the by the MAIN MEDIA, and governments of this world is "DENIAL". In researching any given background topics, that is what one always finds, loads of denials. The Powers that be, believe that because they have so much power, money and influence, that they can simply brow-beat the masses into submission, by all their propaganda. If THEY tell you repeatedly, that the moon is made of cheese, they believe that eventually most people will simply believe it, as it takes too much effort for most to fight against the LIES. They have dumbed down the masses, as you know in many ways, so that many people are no longer capable of asking the right sort of questions. As far as I know, all the things that I put in my book are all real, although of course some bits may be embellished somewhat. However just because things seem too fantastic to be possible, as you well know, does not necessarily mean that it isn't possible. We live on a very beautiful world, one of God's marvellous creations, where there are many strange realities. It is my belief that God Himself deliberately made us to be curious, and start asking lots of questions concerning our present reality, and beyond! THE BOOK of ENOCH-interpretations & the book OF 2ND EZDRAS- interpretations. THESE TWO NEW BOOKS WILL BE AVAILABLE AT THE END OF AUGUST 2017. I WILL POST WHERE YOU CAN BUY THEM CLOSER TO THE PUBLISHING DATE. As my previous article on my BLOG mentioned, by the end of August, I will D.V. be coming out with two new books. 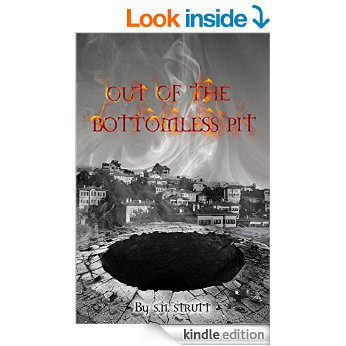 My first book 'Out of the Bottomless Pit' was published in 2014, firstly as a paper-back, which was amazingly completely paid for by friends and readers, who were interested in the book. A VERY BIG THANK YOU, AGAIN! I then self-published another KINDLE version on AMAZON. However with these two new books: 'THE BOOK of ENOCH interpretations' and '2ND EZDRAS interpretations', I was only considering making KINDLE and pdf copies, as I could self-publish them, and there would be no major expenses. However, I have recently been contacted by many of you, who bought my first book, and who stated that they would like to have a paper-back copy of the new books. As there is a desire for PAPER-BACK copies, by friends & members of the public, I would again encourage any of you who would like to DONATE to help publish the above-mentioned books. The cost last time, was £350+. For the two new books, I reckon they will cost around £250/each to actually print & publish as a paper-back. "OUT OF THE BOTTOMLESS PIT" IS A FASCINATING BOOK, COVERING A WHOLE SPECTRUM OF STRANGE AND AMAZING PHENOMENON. IT IS VERY WELL RESEARCHED AND WELL WRITTEN. REVIEWS for new author S N Strutt new book have mostly been RATED as 5 STAR. Get your copy of this UN-MISSABLE BOOK which will shake the foundations of what YOU have perceived as REALITY as it EXPOSES the LIES & CORRUPTION behind our physical DIMENSION. Hi Steve, I hope and pray you are all well! I'll pray for you and your ministry of Truth, in this time of mass information, misinformation and disinformation, as you say it so well, and God bless you for wading and seeking the Truth in all that. I do think you are doing a wonderful job! God Bless You and Keep Going For God! Wow!... What a book!!! 😉 l LOVED it!.. It's both exiting, exhilarating, scary, shocking and absolutely AWESOME!!! What an expose of the current world powers and the many secrets they are hiding!!! 😱 Who would have guessed things are this messed up on our planet!? You are brave to have written this book! I know that you will get some heat for the truth therein. But l also know, that the ELITE are scared of the message you are sharing, and will try anything to stop people from buying a book that is so dangerous to them and their "secret plans"
The thing is I know that there is an audience out there that love books like yours 😉 and chat rooms are a live chat with lots of people worldwide! This amazing book gives in depth explanations of many fascinating subjects about the paranormal and mysteries of all times, as well as insight concerning current matters. It will make you want to investigate for yourself and will give you a craving for more. Reading this will open your eyes to new ways of seeing things. I highly recommend it. I’m so thankful for your research as well as your new book "Out of the Bottomless Pit" and the postings on your website. I’m going to write a recommendation for your book on the Amazon site. "It's fascinating, it's fantastic, its indescribable, it’s mysterious, it's beyond imagination, it's shocking with new concepts, its breathtaking, it's 'out of the box'"
(I recently fell & broke my radius bone. Being immobilized for a while, I thought of reading a book – Something that I nearly always postpone due to lack of time. I didn't know what to expect, but after a few pages, I was like transported into another world & dimension. Maybe the same feeling I had when I was 6-7 yrs old, when I was so fascinated by the book : “Alice in Wonderland" by Lewis Carol. I loved it! Why? Like when you are in a dream, new things keep on coming up, and you do not want your dream to end...as you are really enjoying the ride. That's the way I felt with “Out of the Bottomless Pit”...I had to keep reading until I had to have a break...but it's an amazing book, a must be read! I always have been fascinated with some of the topics of this book, but the more I read it, it's like " I thought I knew a bit ...but now I know that I didn’t know" Ah! Powerful thoughts there! Lot to digest & study for yourself ...it'll surely arouse curiosity about these strange mysterious matters... I guess it's intent is just to wet your appetite. Inspiring & a worthy spiritual trip that will leave you with the feeling that you do not want to end the "dream" Open your mind to the many endless questions or further dreams... & to find out the real Truth. Sit down, relax & enjoy the ride! You won't regret it. I myself found it quite believable though & accurate. I found that this book is better than science-fiction. It gives you a new insight about a lot of different topics. (From lies we have been led to believe - to large scale cover up's)... If truth is stranger than fiction, then this is the book for you. I read an advanced rough copy of this book some time ago, and it is absolutely staggering, & probably the only one like it on the market. It is a very brave book, and pulls no punches. I agree with all of the write-ups on the back page of the book. I thoroughly recommend this book for those investigating the TRUTH about our world and beyond! I read a rough copy of this book about the paranormal a few months ago. It is very intriguing and at times scary, but has a lot of answers. An excellent and unusual combination of subjects. It is one of a kind, and I agree with both the FORWARD & all of the write-ups on the back-cover of the book. I certainly enjoyed reading it, and am much more knowledgeable because of it. I certainly recommend others to read it, as it has a lot of truth in it as well as exposing many of the villainous lies that run our world today. If you want to find out some of the causes of some worldwide mysteries, this book will give you good arguments and will satisfy your curiosity. Congratulations dear S.N. for researching and giving new lights about them. These are very uplifting besides. I read the first few chapters and it is very interesting. read it on the train to work in the mornings .I read the first few chapters and it is very interesting. Brilliant book! I found it intriguing with great concepts.